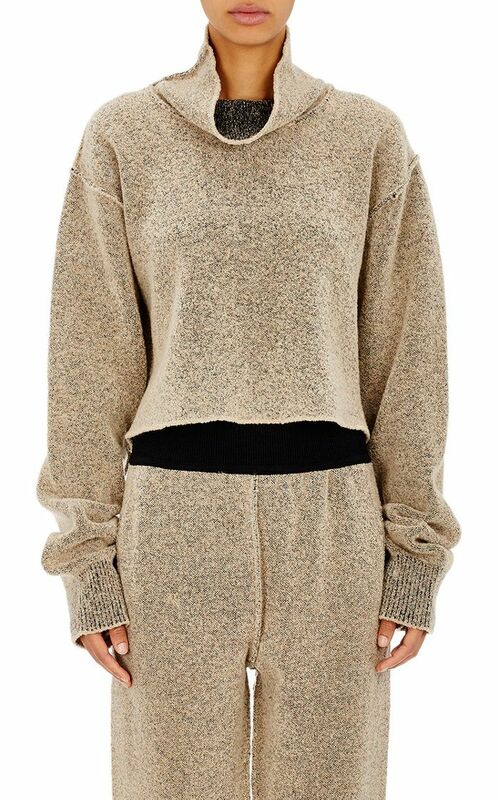 In news that is bound to surprise no one who fancies splurging on loungewear, Kanye West's Yeezy Season 1 line has nearly sold out, only a few days after it initially dropped. According to WWD, the line—which debuted at New York Fashion Week this past February and hit stores like Barneys New York last Thursday—is selling extremely well across stores, including Barneys, Mr. Porter, and a number of others. "Aesthetically the collection works very well," Mr. Porter head buyer Sam Lobban told WWD. "The styling of the show may have been specific for some people, but ultimately it was a show and thus a statement. As individual products, these are very well-made, with high-quality fabrications in easy, wearable shapes." Perhaps most surprising, according to Tom Kalenderian, Barneys executive vice president of menswear, the bouclé sweater—which retails for a whopping $1690—was one of the site's best sellers from the collection. It's a very impressive start for West, who is still a relative newcomer to the world of selling clothes. Keep scrolling to shop our favorite pieces from Yeezy Season 1 now! What do you think of the collection? Tell us in the comments below!